I find myself getting more and more back into classical film photography, especially medium format (just got another TLR camera). Although it will never replace digital, I prefer it now for staged shots, where I have loads of time. Anybody else shooting MF film here? Especially with older 1940-50 cameras? As it is not really necessarily Pentax related, do you happen to know any lively MF forums? www.apug.org is always a good souce for info on film cameras. Someone there was selling 2 Pentax 67's in the last day or two. After putting a few rolls through it, I'm sure you'll change your maind about it replacing digi. I have a Yashica Mat EM TLR. I have used Fuji Provia and Velvia, which I both like. Have you used anything (color slide film) from Kodak recently. Do they offer anything that Fuji doesn't or that they do better? on demand histogram is the single most important "fake" gimmick that has compressed the time it took me to learn photography from years to months, not to mention the money saved from endlessly wasting film and darkroom hours to understand how the world-lens-film relationships work. Originally posted by Urmas R.
Other than the ocasional Kodak colour plus, and 1 roll of T-Max 100, I haven't used any Kodak, I'm a Fuji guy. I love shooting medium format! I have a nice Yashica 12 (basically a 124G without the support for 220 film.) I also got a nice AGFA Isolette folder from my dad that I cleaned up. I would love to see a digital version of the MZ-M, with an LCD screen and histogram, but only manual controls. It would be the ultimate photographic learning accelerator. I have to agree here actually. My way of shooting with K20d has also been in full manual mode and then checking the histogram for every shot. It is so nice and easy to learn from it. I would be totally broke, if I would have learned it all in film. Luckily I have had the chance to do it in parallel and they complement each other very well. Try the Kodak Portra negative films - especially the NC for portraits. It is superb!! Another thing to do is rate your film 1/3 - 1 stop under the suggested ISO. Then get it processed as normal. Gives you more shadow detail. And gorgeous colours. Straight out of the camera. Better than anything digital can do. No noise and no post processing time. Just pure pleasure!! I only shoot film using cameras from 1920-30s, and others, but mainly in B&W. Medium format is great to use, good luck and keep with it. I do the same. Kodak Portra NC 400- and 800 about 1/3 under suggested ISO. It is time consumming, however, it's very enjoyable . Frints have a very unique and artistic feeling. Plus I don't have to worry too much about purple fringging. Like everyone else, I just don't do this very often anymore, however, I will not get rid of my film cameras. found this in my basement. was my grandfathers. i havent tried it out yet though, but it seems to be working without any film. Wow! Lucky you! 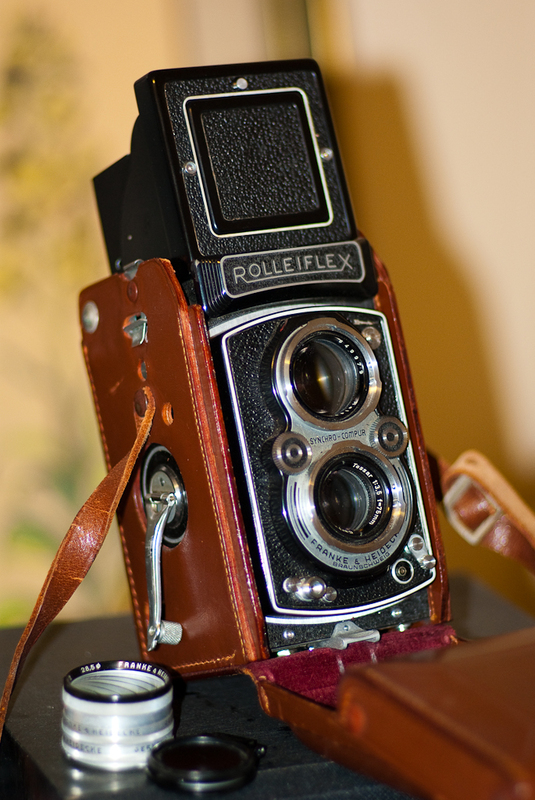 The Rolleiflex cameras go at a pretty high price in Ebay. I'm a film-shooting anachronism in both medium format (Pentax 67II) and 35 mm.